LES is HIP | NYC Arts! I haven’t spent much time on the Lower East Side of Manhattan, so I didn’t quite know what to expect when I made my first trip in quite a while to check out the art scene. Tucked between shops that are too trendy to afford, bargain stores filled to the brim with knickknacks, and enough bars to provide intoxication to the entire state are small independent galleries showcasing work of local artists. The term ‘local’ is used loosely here to cover all five boroughs, as I saw work from artists that reside in a multitude of places, from Harlem to Williamsburg. The galleries are surprisingly well suited to the colorful, incongruous nature of the Lower East Side, and the work within tends to have a grungy nature that seems to reflect the urbane streets. I stopped at several galleries on my trip, and saw a few standout shows. One such show was that of Diana Shpungin, titled ‘Many Failed Returns’, in the Stephan Stoyanov Gallery on Orchard Street. The show is only going to be there a little longer, as it ends on July 3rd, and I am pleased that I had the opportunity to see it before it goes. The show is based on the death of the artist’s father, and her moments of remembering and missing him. The art itself seems to be what she used to cope with the loss of one so close to her, and because of this, her melancholia reads quite clearly in every piece. Shpungin works in various media, from assemblage to pencil on tracing paper, using sequential panels to lend her work an animated feel. Several pieces were a combination of panels that showed a progression. 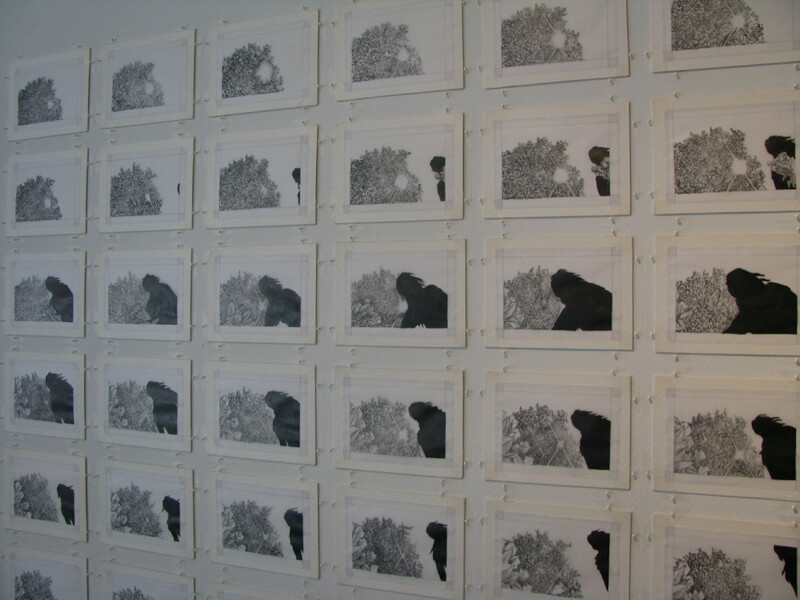 Two such works are in her show, one that shows a figure stepping into the frame and retreating, and another that shows her father, lying unchanging (even over the course of nearly 50 frames) in his casket. The latter piece strikes me the hardest; it encourages the viewer to keep looking in each frame for a change, even once it becomes obvious that there isn’t going to be one. By simply repeating the same image, the artist has managed to make me actively wish her father would move from his resting place. The gallery is small, but Shpungin makes the space work for her. The soft sounds of seagulls and waves at a beach come through the speaker system, and even a badly placed pipe in the center of the room becomes part of a piece. The basement is likewise utilized, in its naturally creepy splendor. Shpungin forgoes lights and uses the darkness of the basement to show her animated sequences on projector screens, as well as to drive home the absolute nature of death. 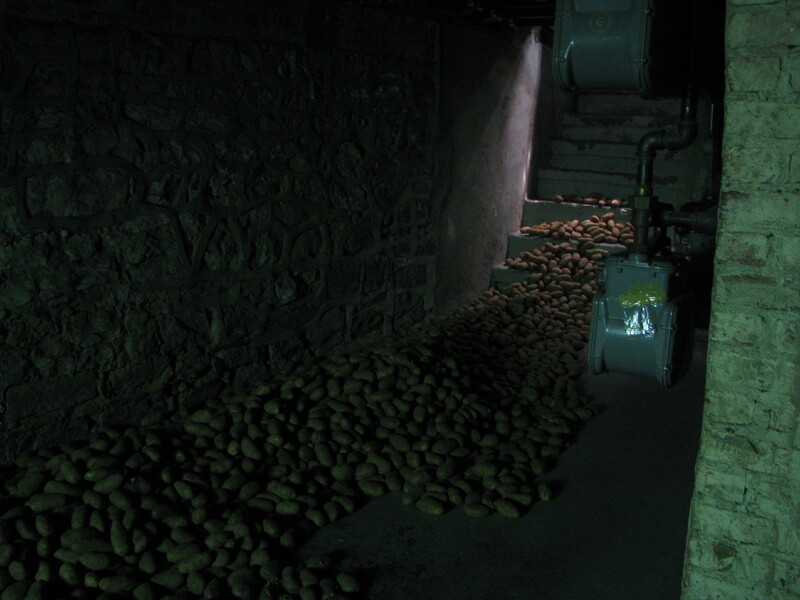 She also taps into her father’s past, piling potatoes on the basement steps in remembrance of his story of buying his first car on the Soviet black market with potatoes. Such things like that add another dimension to the show, and turn it into an all-encompassing experience. I highly recommend seeing this show before it leaves. It’s not every day that a show can move me to being disturbed even after I’ve left the gallery, lost in thoughts of the nature of death and feeling sad over the loss of a man I never knew. It is a deeply personal journey that the art leads the viewer on. Diana Shpungin has successfully trapped a wealth of emotion in her work, so much that the viewer can’t help but be affected by it. 27 Jun	This entry was published on June 27, 2011 at 9:16 am and is filed under Lower East Side. Bookmark the permalink. Follow any comments here with the RSS feed for this post.